Public Security Minister warns of potentially dangerous consequences of Erdogan's statements, as Turkish ambassador summoned for rebuke. 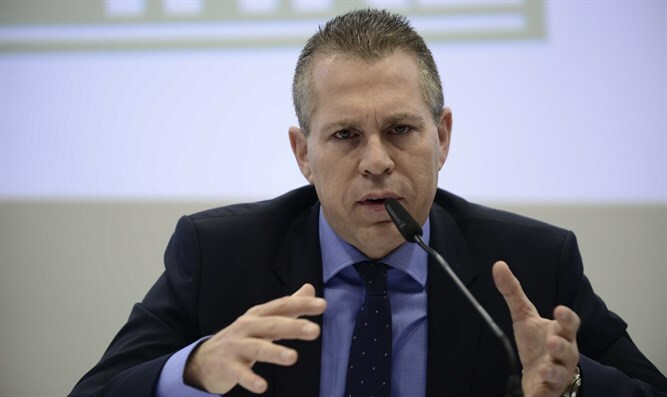 Public Security Minister Gilad Erdan related to the recent string of verbal attacks by Turkish President Recep Tayyip Erdogan against Israel, blasting them as baseless accusations and warning of their potentially dangerous consequences. The Minister's words came as Chairman of the Foreign Ministry Yuval Rotem summoned for rebuke this morning Turkish Ambassador to Israel Kamel Okem over the Turkish President’s statements. Rotem told the Ambassador that Jerusalem is paying no heed to Erdogan’s slanderous talk, and will continue to maintain freedom worship for all religions. Over the past 24 hours, the Turkish President has made various pronouncements lambasting Israel. The Ma’an news agency quoted a statement released by Hamdallah’s office, according to which Erdogan “confirmed the necessity of unifying efforts to protect Jerusalem against attempts of Judaization,” and called on as many Muslims as possible to visit the Temple Mount in order to emphasize the bond between Islam and the site. He said that “Israel keeps escaping punishment, which leads it to escalated aggression against Palestinians,” and claimed that peace attempts will fail “unless Israel is held accountable for its crimes,” according to the Ma’an news agency. In turn, these statements came on the heels of others he made calling on Muslims to ascend the Temple Mount as a show of solidarity with Palestinian-Arabs in their “fight for rights and justice,” and slamming Israel’s proposed Muezzin Bill, which seeks to lower the decibel level of muezzin calls in mosques during sleeping hours. "The fact that those who talk about freedom of thought and faith at every opportunity actually approve this step by remaining silent is noteworthy. We will not allow the silencing of prayers from the heavens of Jerusalem,” he had said.